My first day at Google was certainly a mind-blowing experience. I had been up later than I wanted last night, finishing some stuff on my home computer, but I still had plenty of time to get enough sleep and be ready to go in time to get to the 9:30 training. I'm glad I checked for the building number before I went to bed. I had only THOUGHT it was 9:30... it was actually at 8:45! Bleary-eyed, I got up to my alarm clock's wail, showered, shaved, grabbed a Diet Dr. Pepper (which has caffeine in it), and hit the road. I was scared to take 101N at that hour, so told my GPS to take me by way of Central Expressway instead. Google has shuttles, and there's a stop not too far from me, but since I didn't have a badge yet, I had to drive in myself. Since I have a gym appointment tomorrow, I won't be taking the shuttle tomorrow either. But that's tomorrow. For today, I was showing up for orientation; I felt like a freshman! The excitement, the strange newness of everything, the campus-like atmosphere... it's been a long time since I've been in a completely foreign job. Really, I was walking into this place quite blind... at my other jobs, I've had a better feel for the company and my role in it. Not this time! Google was— and still is— quite mysterious to me. I felt like I had walked into Oz, or maybe Willy Wonka's chocolate factory. One of the first things I did today was to get my picture taken for my badge; I think it turned out well. Most of the day involved Google shoving lots of new-hire information into my brain. You may have questions about the benefits they offer. Fortunately, you can read http://www.google.com/support/jobs/bin/static.py?page=benefits.html for that sort of thing. I also learned about vital things like how to contact the internal tech support (they seem to provide an INCREDIBLE quality of service), who to call if there's a security issue (and a funny video on the topic), and lots of other new-hire stuff. So far, no technical information about my area, but they were kind enough to preschedule me for relevant training classes for a few weeks. All this showed up on my Google calendar; it looks like I've got about 50% of my time in classes for next week. When I went for lunch, I ran into Gwynne, who had been my boss's boss at Juniper until about two months ago. It was great to see her; it was the first bit of grounding I'd had all day. Yes, Toto, Kansas is still on the map! After lunch came more classes, and paperwork like W-4 and I-9s. (I didn't have my W-4 calculations with me, so I just made a conservative estimate.) Finally, I was greeted by my assigned mentor. He took me to pick up my laptop. We went into the area where they give laptops to Nooglers, and there were several around with people's names on them. Not one for me, though. So at the moment, I have only my desktop computer. That's okay for now... I have enough to think about at work, without taking it home with me. They took down my name, and said they'd contact me tomorrow. Finally, we walked to my desk. 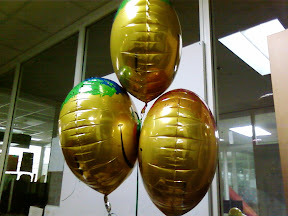 There was a bundle of balloons there, greeting me. My mentor also introduced me to my manager. That's right, I have a manager! I've been assigned to a team! I'll have plenty of time to go into more detail another time, but briefly, I'm on the team that makes sure ads are displayed. Since that's a revenue stream, it's a visible role! About 18:45, my mentor left— he had a prior engagement— and I sat down to collect my thoughts. I really felt like I'd been drinking from a firehose all day, and was really rather dizzy. But no! I had hardly started to get my bearings when my iPod popped up an alarm... I had nearly forgotten my 19:30 improv class in San Jose! I quickly packed my stuff, and hit the road. It occurred to me that (1) there's no way I'd get to San Jose in time, and (2) there'd been a plan to move to a different location. I called Danielle— a friend who's in the same class— and got the info from her. It was in Mountain View, just a few exits away! Huzzah! After the improv class— sometime around 10:30 or so— I came back to campus, since I wanted to keep a photo log of my Noogler balloons. Tradition has it that you're considered a Noogler until they loose enough buoyancy to hit the desk. I still haven't gotten my bearings mentally, but was able to successfully find my desk. This place is like a maze inside... I was seriously worried about that! During the improv class, one of the things we did was pair off, and one of us would close our eyes and the other led them around the room. That's how I felt navigating this complex most of the day. But now it's late, and tomorrow is another day... one for which I should be well-rested.